A piece of jewelry is far more than just the sum of its metal and mineral parts. A truely great piece of jewelry is the type of object that lights up the room around you, it is the essential accessory, and at the same time, the perfect gift for a loved one, or even for yourself. 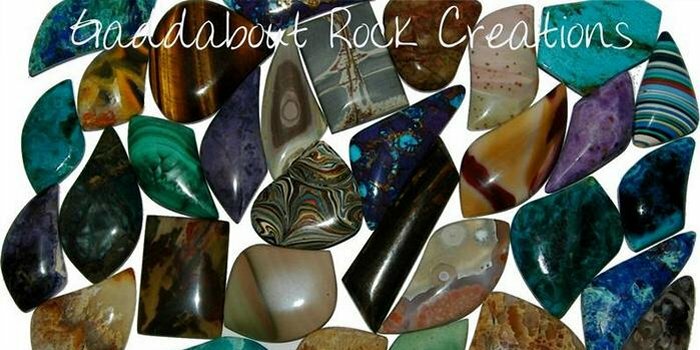 At Gaddabout Rock Creations, we understand that when you buy your cabochon jewelry, you are looking for far more than just a hunk of material, you are looking for an accessory with a spark of life all its own. That is why we urge you to give our top of the line range of cabochon gemstones, pendants, and Cabochon jewelry, a look. Of course, with the vast array of stores online these days, it can be very hard to decide who to trust when it comes to buying your jewelry. That is why at Gaddabout Rock Creations, we only use the very best in materials and cabochon gemstones to make our pieces. We stand by our product, because we believe in it. We have a money back guarantee! So if the idea of owning your own piece of jewelry appeals to you, or possibly to someone close to you, we would ask you to check out what makes our designer cabochons and other cabochon pendants the best at our about us page. If you would be more interested in seeing what sort of products we can offer, feel free to check out our products page where you can see what sort of things we make from our cabochon gemstones. And remember: a piece of jewelry is more than the sum of its parts. Don't you or your loved ones deserve the very best? Copyright 2013: Gaddabout Rock Creations | All rights reserved. Discover the Beauty of a Rock!